In the Autumn of 2013 Vince Cable was the Tory/Lib-Dem Coalition minister who sold off the Royal Mail to a bunch of private profiteers at way below its market value. In 2017 he has the absolute brass neck to complain about the consequences of that sale. Vince knew that he was ripping off the public by flogging the Royal Mail at way below its real market value, but he simply didn't care. Vince knew that public opinion was dead set against the sell-off, with 67% of the public against to just 20% in favour, but he went ahead anyway. 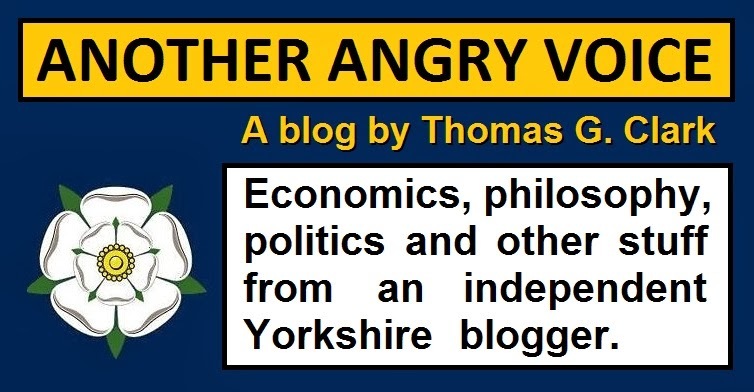 Vince knew that Royal Mail sorting offices across the nation were sitting on prime bits of development land worth £billions, and that the sale of just a few of these sorting offices would recoup the entire £2 billion price he flogged the Royal Mail off for. In hindsight the sale of the Royal Mail has been described as "crony capitalism at its worst" and the widespread predictions that the private owners would cash in on the property portfolio have come true. When Vince Cable flogged off the Royal Mail in 2013 he valued the 6.25 acre Mount Pleasant sorting office at £29 million. Just a few years later in 2017 the private owners flogged it off to developers for £193 million. A cool £164 million profit at the public's expense. The same story in Battersea where 2.7 acres were sold off for £101 million, when the "book value" of the land was marked as just £12.9 million when Vince flogged it off. 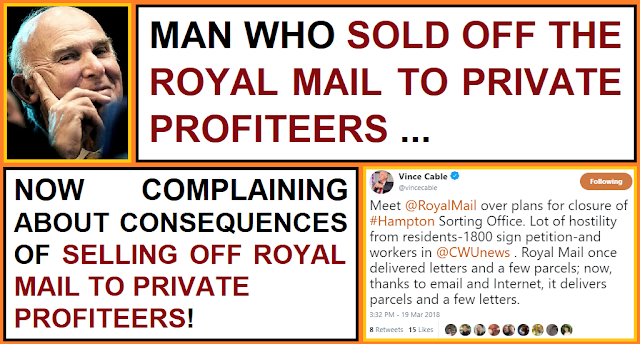 The sale of just two London sites has raked in almost £300 million for the private owners of what was our public property just a few years ago, yet when Vince flogged it off he priced the entire Royal Mail property portfolio of over 2,600 sites at just £787 million! Within five years the private profiteers Vince flogged our property to have recouped almost half of his total property valuation with just two property sales! Anyone would have thought that the man responsible for inflicting such a brazen rip-off on the British public would disappear from public life in shame, but not Vince. After losing almost all of their MPs as a result of their collusion with the Tories and their ruinous austerity agenda the Lib-Dems have been left with a rump of just a dozen MPs, and in their wisdom they decided to appoint the man responsible for this outrageous rip-off as their party leader! 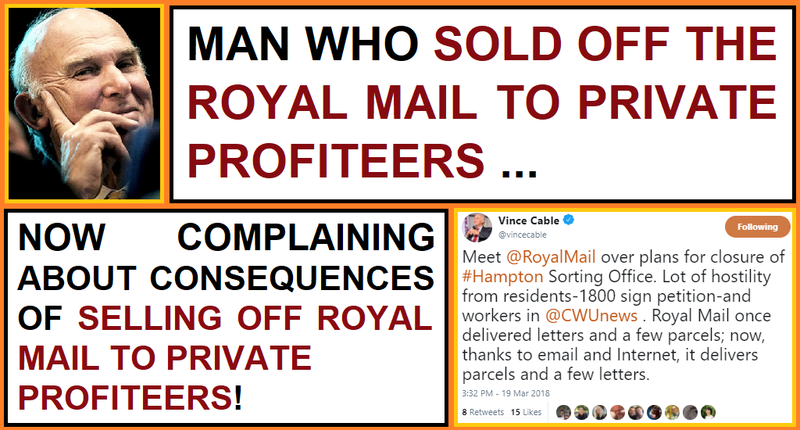 And now Vince is on Twitter complaining about the planned closure of the Royal Mail sorting office in Hampton in his own constituency. Vince Cable was responsible for one of the most brazen public swindles of the Coalition government, but he's so arrogant that he thinks that everyone will have just forgotten by now. He's so confident that he's got away with this massive swindle that he's actually trying to score political brownie points for protesting against one of the consequences of the rip-off privatisation he carried out less than five years ago!